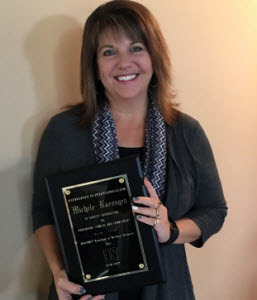 Associated Bank’s Michele Haensgen, residential loan officer in Fond du Lac, Wis., was recently awarded the REALTORS® Association of Northeast Wisconsin (RANW) Excellence in Professionalism Award. The RANW Excellence in Professionalism Award recognizes REALTOR or affiliate members who have made an outstanding contribution to RANW through committee work, leadership, board activity, or state or national achievements and involvement. Haensgen has been an active member of RANW for the last several years, and has served as chairperson and a committee member for multiple events.